This is the second tutorial in the Geometer’s Sketchpad Essentials Series. In the first tutorial of this series, we used Geometer’s Sketchpad to construct medians of the triangle and found out that the medians intersect at a point. In this tutorial, we are going to learn how to use parallel and perpendicular lines to construct a rectangle. Figure 1 - The rectangle construction after step 11. 2.) 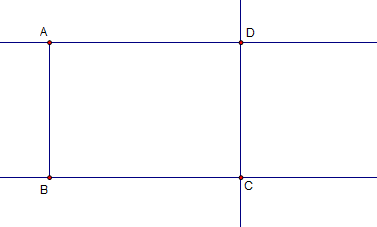 Construct a segment using the Segment tool.